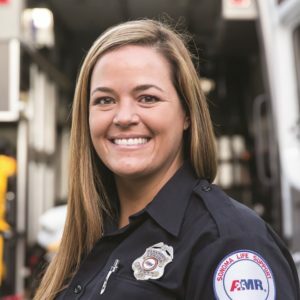 If you are lucky enough to be partnered with Andrea Strongman, the chances of your having a slow shift are low: She has a reputation for being dispatched whenever a big event or rough call occurs. This reputation was solidified on October 8, 2017, when a devastating fire hit the Sonoma Valley region. Andrea and her partner were working the night shift when the fire began. High winds quickly spread the fire across the region, knocking down power lines and inundating the area with smoke and ash. The pair were dispatched to evacuate a paraplegic patient from his home, which was in the direct path of the fire. They arrived to find the house engulfed in flames with no firefighting resources available. Despite making every effort to gain entry, the flames were so hot and destructive it became clear the fire would prevent any further rescue efforts. Distraught, Andrea and her partner had to compose themselves so they could continue to run calls being dispatched that night. Together, they performed countless residential, hospital, and skilled nursing facility evacuations, in addition to emergency medical transports to the ERs that were still open. Andrea accomplished all of this in the midst of consoling and reassuring several of her colleagues who had lost their homes. Andrea’s partners may not always benefit from her reputation, but without question her community and her patients do.